Iran has unveiled its biggest domestically developed unmanned aerial vehicle (UAV), which can be used for reconnaissance and combat operations. 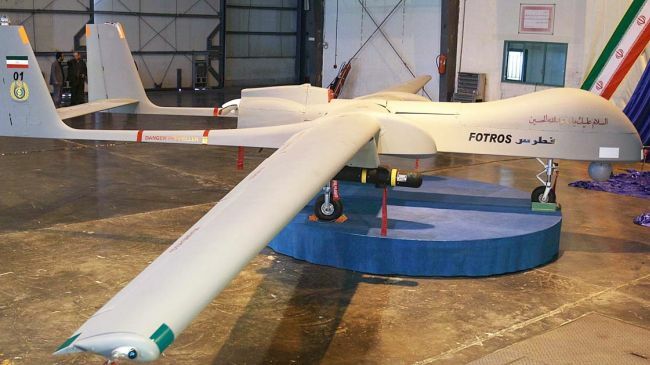 The remote-controlled aircraft, dubbed Fotros, was put on display at the headquarters of the Iranian Armed Forces Aviation Industries Organization (IAFAIO) in Tehran during a ceremony attended by Iranian Defense Minister Brigadier General Hossein Dehqan on Monday morning. The drone has been designed and manufactured by experts at Iran Aircraft Manufacturing Industries Company, which is affiliated to the IAFAIO, and in cooperation with the country’s academic centers to meet the nation’s defense needs, said the top commander. The strategic UAV has an operational radius of up to 2,000 kilometers, an operational altitude of 25,000 feet and flight endurance of up to 30 hours, said the defense chief. The Fotros drone can be used for reconnaissance and surveillance, and has the potential to carry out combat operations once armed with air-to-surface missiles and other types of rockets, the top general noted. “The protection of maritime and land borders, monitoring of oil pipelines and telecommunications lines, road traffic control, the surveillance of areas struck by earthquakes, blazes and floods, environmental monitoring for the sake of environment protection, and the transmission of precise images and films throughout the mission are among the capabilities of the Fotros drone,” Dehqan pointed out. On September 28, the Iranian Army’s Ground Forces unveiled an indigenously designed and built combat drone, dubbed Yasir, in a ceremony attended by senior military officials. The drone can fly at an altitude of 15000 feet, has flight endurance of eight hours and an effective operational radius of 200 kilometers. Iran unveiled its first domestically manufactured long-range combat drone, the Karrar (Striker), on August 23, 2010. It reportedly has an operational radius of 1,000 kilometers (620 miles) and can carry two 115-kilogram bombs or precision-guided munitions weighing 227 kilograms. Tehran has repeatedly assured other nations that its military might poses no threat to other countries since the Islamic Republic’s defense doctrine is entirely based on deterrence. This entry was posted in Iran and tagged Fotros, Iran, Iranian Armed Forces Aviation Industries Organization, UAV. Bookmark the permalink.